Legendary Dallas Cowboys running back Calvin Hill remembers how he came to understand what he was fighting for during the civil rights movement. He grew up outside Baltimore and was bused to a segregated elementary school before attending an elite private high school in the Bronx, New York, where he was one of only five black students. “The day we marched on Washington” in 1963, Hill was 16. “There was such a spirit of people just hugging and joining hands and singing together, I thought segregation was going to end, you know, that day,” he recalled. On Saturday, more than half a million people are expected to gather in downtown Washington, D.C., for the March for Our Lives anti-gun violence rally, and a great many of them will be young. The demonstration was conceived after last month’s school shooting in Parkland, Florida, that killed 17 people and sparked a wave of teenager-led protests that have gained high-profile friends, enemies and national attention. But this is not the first time the nation has witnessed the power of youth activism. This anti-gun violence movement mirrors a protest tradition that decades ago recognized the moral sway of children who put their bodies, and often their lives, on the frontlines of a changing nation. “If you look at what the civil rights movement was, it wasn’t necessarily about blacks wanting to go to school with whites. It was about wanting to have equal resources and equal opportunities,” said Hill, 71, a consultant for player development for the Cowboys who lives with his wife, Janet, in Great Falls, Virginia. And that desire fueled a movement of African-Americans, including some who were very young, who filled the streets of the nation. It’s an era that the four-time Pro Bowler and first Cowboy to rush for more than 1,000 yards in a season (not to mention the father of former NBA All-Star Grant Hill) remembers well. He grew up with the signposts, totems, deprivations and dangers of Jim Crow segregation. Hill often visited relatives in South Carolina, and as a youngster he thought perhaps ginger ale flowed from “Whites Only” water fountains. One day, with his cousins as lookouts, he took a sip from one, then dashed around the corner. Later, as a seventh-grader who’d been bused to black schools, he attended a student council meeting at the local all-white high school and was stunned by the quality of the facilities. “They had a gym that looked like a movie theater with permanent seats. We had a gymnasium that became an auditorium when you put seats on the floor.” The white school’s library was three times as big, and it had air conditioners in the windows. Hill attended the progressive Riverdale Country School in New York on scholarship for high school. The school invited Martin Luther King Jr. to speak, and husband-and-wife actors and activists Ossie Davis and Ruby Dee were friends of some of the parents. The month after the March on Washington, he joined fellow students in New York to protest the church bombing by white supremacists that killed four young African-American girls in Birmingham, Alabama. He also attended sit-ins and protests in Baltimore. In 1957, the National Guard and a snarling white mob blocked the entrance to Arkansas Central High School by the Little Rock Nine, the youngest of whom was 14. 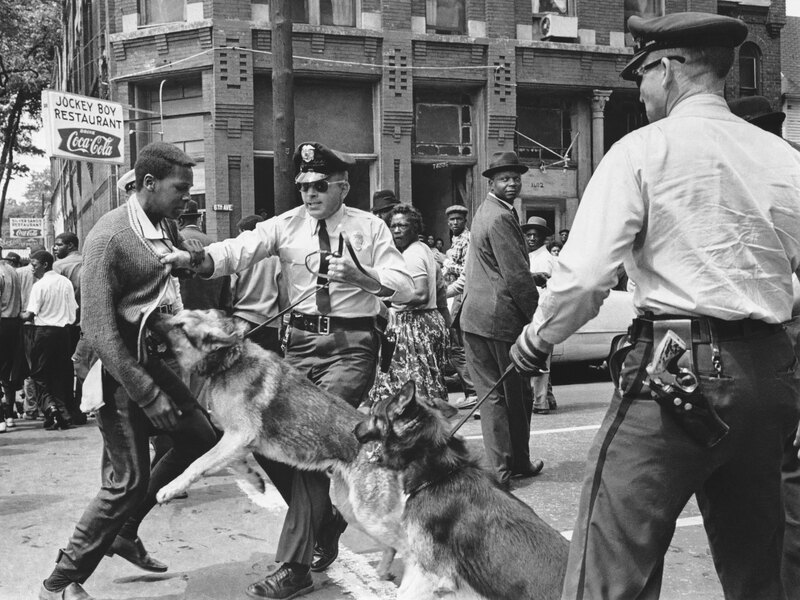 In the 1963 Birmingham Children’s Crusade, dogs and hoses were turned on children, and the images of them standing up until they fell gained a global audience. A 17-year-old civil rights demonstrator, defying an anti-parade ordinance of Birmingham, Ala., is attacked by a police dog on May 3, 1963. On the afternoon of May 4, 1963, during a meeting at the White House with members of a political group, President Kennedy discussed this photo, which had appeared on the front page of that day’s New York Times. Hill was the same age then as the new wave of protesters now converging on Washington, and he calls that need to change what you feel must be changed a natural inclination for those old enough for idealism and too young to be jaded. “To sin by silence when we should protest makes cowards out of men,” Hill said, quoting poet Ella Wheeler Wilcox. He recalls visiting his grandfather when he was around 7 and, along with another cousin his age, going into a clothing and fabric store with another cousin who was 14. A white teenage girl struck up a conversation with Hill, and he told her she should talk to his teen cousin since “my cousin likes girls.” He then told the teen cousin he should talk to the white girl, since she liked boys. The 14-year-old “immediately got a look on his face and said, ‘Let’s go.’ And when we walked to my grandfather’s house, instead of going along the road, we walked through the woods,” Hill recalled. “And I couldn’t understand why he was doing that.” When they got to the house, he was berated by his aunt, who warned him never to do that again. Hill thought about that incident when he saw the casket of Emmett Till at the National Museum of African American History and Culture. One of the Four Freedoms that President Franklin D. Roosevelt talked about was the “freedom from fear anywhere … in the world,” Hill said, and that’s part of what young people then and now are fighting for. The civil rights movement was also filled with young white people who marched and, in some cases, died. The murders of white activists Andrew Goodman, 20, and Michael Schwerner, 24, of New York City, along with black activist James Chaney, 21, caused a national furor. And in the current protest moment, the white activists have gotten younger and have sought to strengthen ties with young black protesters from communities victimized by gun violence. Hill sees their voices as a hopeful sign. Many will marvel Saturday when the eyes of the nation turn to the teenage activists who insist against the odds that they can change the world. But among African-Americans, not only has the idea that a child shall lead the way always been the case, in some of our darkest moments, it’s been an article of faith.